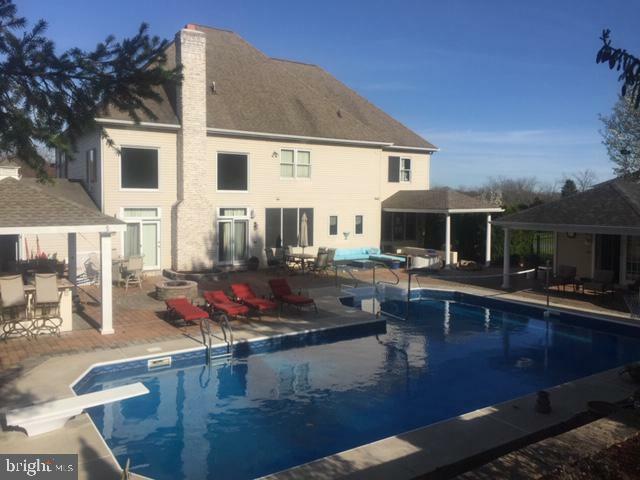 Come experience the show-stopping backyard complete with inground heated low maintenance salt-water pool and a pool house with a changing room and storage, paver patio surround and outdoor bar area with mini frig & grill. Pool has brand new liner (2017). Plus finished basement with Full bath and wet bar that make this a great home for entertaining in any season. Gourmet kitchen with center island, granite countertops, tile backsplash & more! Tiled spa owners bath, 1st floor office could be a 5th bedroom. Dual Staircase leads to new hardwood floors in hallway, fresh paint and new carpet in 3 bedrooms that all have walk-in closets. 4 car garage is ready for you on a cul-de-sac in Floribunda! PRE-INSPECTED HOME means peace of mind for buyers! Pre-approved buyers only, thank you! A joy to show.